Early and incorrect view of the Hydrogen atom. A slightly more accurate view of Hydrogen. A Hydrogen atom consists of a proton and an electron which are “bound” together – the proton (positive charge) and electron (negative charge) stay together and continually interact with each other. 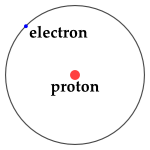 If the electron escapes, the Hydrogen atom (now a single proton) is positively ionized. Similarly, the Hydrogen atom can sometimes bind another electron to it. Such a Hydrogen atom is negatively ionized. In astronomy, the former kind of ionization is much more common. In heavier atoms, the proton is replaced with a mixture of protons and neutrons collectively called the nucleus. The nucleus of the Hydrogen atom is just one proton. Helium, on the other hand, has two protons and two neutrons for a total of four nucleons (a “nucleon” is a general term for particles which are either a proton or neutron). A Hydrogen atom is an electron and proton bound by the electromagnetic force (an attractive force between oppositely charged particles). Because the electron is so much less massive than protons, early physicists visualized the electron as being like a tiny planet which orbited the proton which acted like a tiny sun. Though this view has the advantage of being easy to visualize, it is just an approximate physical representation. 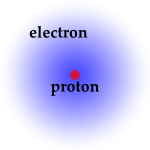 A more physical view of the Hydrogen atom is one where the electron is not seen as orbiting the proton like a planet around a sun, but exists as a diffuse cloud surrounding the nucleus. Only by measuring its location can one know where the electron is (or rather was, as once the electron’s position is measured it moves to a different place). The region where the electron is probably located is called the “electron cloud”. In some cases, the single most probable electron-proton distance happens to correspond to the distance of the more planet-like model. Probability density of the electron for the ground and two excited states of Hydrogen. Brighter regions are regions where the electron is more likely to be found. The density of this electron cloud at any location measures the probability of finding the electron there. In the basic hydrogen atom, shown below left, the cloud is densest in the center and thins out with distance from the nucleus, which means the electron is most likely to be found near the nucleus, in a region about 1/20 nm in size. When additional energy is stored in the atom, the electron cloud takes on expanded patterns with low-density “nodal surfaces” corresponding to the dark rings on the right two panels of the figure below. We call these electron cloud patterns “orbitals” (a term inherited from the early planet-like visualization)and each corresponds to a specific amount of energy stored in the atom. How much (kinetic) energy a planet has determines how far it is away from the star it orbits. Likewise, how much energy an electron has determines how far it is way from the proton (or more accurately, how far out the electron cloud extends). Planets can have essentially any energy and thus orbit at any distance. Electrons bound to the nucleus, however, can not have just any value of energy. The electron can only occupy certain orbital “states”, each with a specific amount of stored energy. An early model which mixed this discrete structure of electron energies states and the planet model is called the Bohr model. Though the Bohr model doesn’t describe the electrons as clouds, it does a fairly good job of describing the discrete energy levels. The Hydrogen Atom Simulator presented in this module is strongly based on the Bohr Model. Because the states an electron occur only at discrete energy levels, they are said to be quantized. The word quantum comes from a Latin word meaning “how much”. The branch of physics that provides the current model of the Hydrogen atom is called quantum mechanics. The electron in a Hydrogen atom can only have certain energies. These energies are called the Hydrogen's “energy levels”. The different energy levels of Hydrogen are denoted by the quantum number n where n varies from 1 for the ground state (the lowest energy level) to ∞, corresponding to unbound electrons. In practice, electrons with high n (e.g. 100 or more) are so weakly bound that even weak disturbances will pull the electron away. where E0 = 13.6 eV (1 eV = 1.602×10-19 Joules) and n = 1,2,3… and so on so that the ground state has energy E1= -13.6 eV and the second energy level (the first excited state) has energy E2 = -13.6/4 eV = -3.4 eV. A hydrogen atom with excess energy is said to be “excited“. The two primary ways to excite an atom are through absorbing light and through collisions. When two atoms collide energy is exchanged. Sometimes, some of that energy is used to excite an electron from a lower energy level to a higher energy level. How many collisions and how energetic the collisions are will depend on how tightly the hydrogen atoms are spaced and their average temperature. How absorbing light causes transitions is discussed more in the transitions background page. Another way to excite an atom is to absorb electromagnetic energy, or in the terminology of quantum mechanics, “absorb a photon”.